In this generation where Social Media has an immense role to play in everyday lives, some drastic changes can be noticed in the Social Media posts. Recently the trend of using hashtag while posting anything becomes notable. As it is the trend, major Social Media users start using several hashtags during uploading any snapshots, video clips, audio clips, and several memes and others. Most of them are unaware of the importance of # in Social Media. Even they are unaware of its first introduction. Any guess on which platform it was first introduced? You might be thinking of Instagram, right? But it is actually not. The first # was used on Twitter on 23rd August 2007 by Chris Messina. At first, the world didn’t accept this; it is when Messina himself started convincing the people about it with its benefits; its journey commenced from Twitter to Instagram. You already know that Social Media has a great contribution to online marketing. It has been observed that 92% of companies which own Twitter account tweet twice or thrice a day. Being the largest Social Media platform, Facebook offers high trafficking and engagement up to 18% only on mid-week. At present, 2.1 billion people own accounts on varied Social Media platforms. 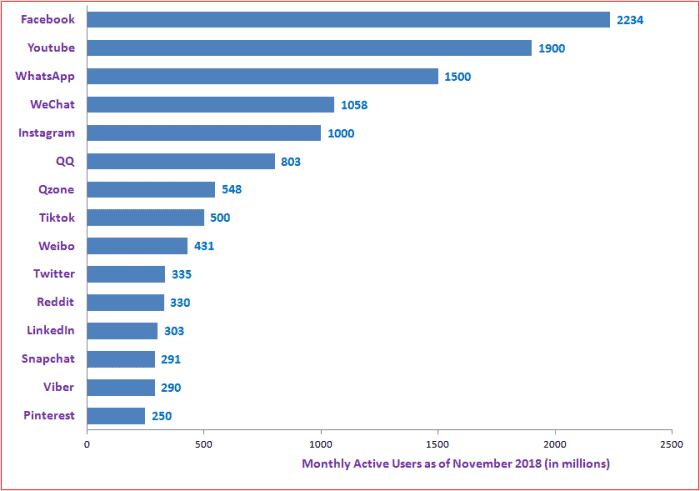 Facebook has a large number of users with 50%. It is followed by YouTube, Twitter, Google+, and Instagram with 28%, 27%, 25%, and 24% users respectively. Keeping beside all these, Instagram is undeniably the perfect for online marketing. If we consider the top-notch multinational companies and brands 90% of the companies own an Instagram account. Gradually, it becomes the first choice for online marketing due to its hashtags option and its impeccable features leaving behind Facebook and Twitter dramatically. Social Media and hashtags definitely have any interlink for which both of these put efforts to optimize the business and increase the traffic. Before we penetrate deeply into the ways to find out the best # and unveil its importance, lets’ check on what Social Media uses hashtags and its performance remarkably. They are great for Facebook, Twitter, Instagram, YouTube, LinkedIn, and Pinterest. If you are looking for trending hashtags 2019 on Twitter, it will provide you with some excellent results based on a few brunch factors. It will ponder your fields of interests, the people you follow and your current location to provide the best result. Furthermore, this Social Media platform allows you to see the appurtenant tweets that are found with these hashtags. It will give you an explicit idea for choosing the right one for your Twitter account. Some examples are Hashtags.org, Rite Tag, WhatTheTrend, and Trendsmap. Be it Facebook, Twitter, Instagram or any other Social Media platform, you must choose the one from its wide array that will attain certain needs of the company or organization. Nowadays, most of the Social Media platforms have loaded predesigned hashtags on various aspects. So after knowing its importance for business, you can find them easily by considering the aspects. When you will get the list of hashtags select the one that suits the demand of your company in its best way. Do you know that many advanced tools are available for choosing the hashtags on specific Social Media platform? But it is your significant job role to find out the best one among it. Many of them are not so excellent in assisting you to find the best one and only a few can do so. You have to choose from them and hunt for the ideal one that will support and covers all Social Media Platforms. It has a great advantage; do you know what that is? You don’t have to develop different hashtags for different social media platforms. The # generator tools like Tagboard will offer you hashtags coherent to all major Social Media Platforms. While competing in this hypercompetitive market, you can able to survive only if your choice of social media hashtags is done according to the niche of your business or organization. For selecting the perfect one for your company or organization, you can make use of several tools. Hashtagify.me, and Rite Tag truly reliable and outstanding for this job purpose. There are innumerable hashtags influencers available on wide Social Media platforms like Facebook, Twitter, and Instagram. A few percentages of such influencers will coincide with your niche or fields of interest. You must find out such influencers and carefully note what type of hashtags they are using. If you face any difficulty in finding out the relevant result, you can simply search by using the generic keyword that represents the specific field. Once you obtain the result look for the popular hashtags 2018. A number has a significant role in making your hashtags popular and effective. According to the Instagram hashtag generator, 30 hashtags are ideal for a respective brand and even it allows only 30 hashtags to develop. But you may find that some renowned brands have less than 7 hashtags and some small businesses have above 20 hashtags. So the decision is completely yours! Just try to make something germane to the niche and area of the interest of your company. You can exceptional and experiment with your hashtags too. If you look at how to use hashtags on Instagram, you can find that most of the companies despite being small or large use brand hashtag. It will garner the attention of the viewer’s easily and augmented the traffic. So, while you are going to develop a hashtag always select the ones with your company. Do you know why people are recommended to create hashtags using brand names? It is simply because; they play a responsible role in advertising and promoting your company and organization in these huge Social Media platforms. Tracking influences in selecting the right hashtags. Hey, are you thinking how? Let us answer you. Suppose you have found top 100 hashtags on Facebook all of which exactly match your niche and aspects. At that time you have to select a few names only from that huge list. After developing hashtags for your brand with the incorporation of those, you have to be tracked on a daily basis from your Smartphone or any other device. Once you are able to track it easily, you will be sure that other people will also find it when they type the letter which exactly matches with your hashtag. It will create an impact on the traffic in another way too. As some people hunt according to the niche, your hashtag will also get displayed by them and they will know about the company’s product and services that will influence the traffic. It is the basic step known by all the people who want to develop a hashtag for their company and organization. If you look at the most popular hashtags 2018, you can find that the renowned brands or people select the hashtags appurtenant to the content, photo, and blog they are posting. It is applicable for you too if you yourself act as a brand or trying to promote any of your hobbies or occupations. Although Instagram has left behind Twitter in developing and utilizing hashtags yet the crucial role is of Twitter. Don’t forget that neither Facebook nor Instagram, it is the Twitter that offers the world a new era of online marketing. Being the originator, Twitter can offer an extensive hashtags’ collection for the hashtag seekers. You have to choose the right one for your company and organization before you know how to use hashtags. Therefore, Twitter is equipped with an in-built search engine that will let you hunt for the ideal hashtag for your company. Keywords search is also applicable in this platform which will let you find out the hashtags coherent to the content of your website. The traffic for your website and the inclination of the target audience is proportionate on how effective and popular hashtags you have chosen. After obtaining long lists of efficient hashtags, usually, people become confused. If it happens with you too, then you must follow this step. Have a look at the top trending hashtags right now and extract a few considerable points on which you can choose the right one for your company or organization. There is another tactic of choosing the best hashtags for your brand. You can post differently by using several selected hashtags. The one which will amplify the traffic will be the best one for your brand. Now, the hashtags can be used both offline and online for the smooth execution of the businesses. Isn’t that worthy? This step is specifically for the startups and for those who don’t have any basic idea about the hashtag. One can be able to find the best Facebook hashtags only via using hashtag tools. These tools are meticulously engineered so that they will provide the result on the basis of the popularity metrics, and data sharing. Some of the tools will even give you the golden chance to know why they are important and how to use them more effectively. 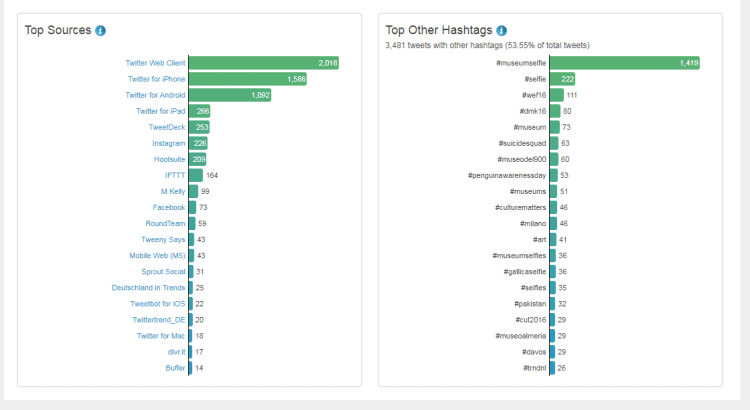 The best tools you can find online are Trendsmap, WhatTheTrend, Hashtagify.me and Hashtags.org. If you want to compare within the best tools you can do so with the help of the option of a comprehensive view. But collecting the information from there, make sure that you are collecting the accurate ones only. Inappropriate timing can affect your online business adversely. Thus, while you are going to develop or launch the hashtag for your company, posts some pre-launching information so that your brand can catch the attention of the viewers. It has been noticed that with the help of this process even the small startup can get a kickstart. This will let you know explicitly why are hashtags still relevant 2019. It increases the traffic for the company and organization by providing original and latest news associated with the events of your brand. While thinking of recycling an existing hashtag, don’t choose from any brands, company or organization which still exists. It can worsen the reputation of your company and organization and trafficking rate will get deteriorate. For this job, you can undoubtedly rely on hashtag tools. Hope now you have clearly understood the prime importance of branded hashtags. Hope, now you have understood the reliable and best ways to find out the best hashtag for your company and organization. Gradually, the Social Media platform starts prioritizing the hashtags which are marvelous in accelerating the rate of trafficking of the website. From this article, you also gain the basic idea of the benefits of hashtags. Its great role in online marketing is truly remarkable. Go today and start developing or creating your brand popularity with a new trend of (#). Who could think that a simple sign will dominate the online marketing business? Manan Ghadawala is the founder of 21Twelve Interactive which is one of the best mobile app development company in India and the USA. He is an idealistic leader with a lively management style and thrives raising the company’s growth with his talents. He is an astounding business professional with astonishing knowledge and applies artful tactics to reach those imaginary skies for his clients. Follow him on Twitter | LinkedIn.